Q What type of back box does the fixture mount to? A The Visual Comfort Thomas OBrien Bryant Sconce mounts to a 3 J-box. Q what type of bulb is used? A The Visual Comfort Thomas OBrien Bryant Sconce in Polished Nickel with Natural Paper Shade with Silver Tape uses (1) 60W Type A bulb. Q Can sconce be used without shade? A The Visual Comfort Thomas OBrien Bryant 1 Light Decorative Wall Light TOB2002PN-NP/ST can be used with or without the shade. It is sold as a set with shade. A The Visual Comfort Thomas OBrien Bryant 1 Light Decorative Wall Light TOB2002PN-NP/ST extends outwards 8.75" from the wall. Q Where is backplate located for mounting & electrical in relation to overall hgt of 15"
A The Visual Comfort Thomas OBrien Bryant 1 Light Decorative Wall Light TOB2002PN-NP/ST overall height is 14.25". The measurement from the very bottom of the fixture to the center of the mounting plate is 4". Q What is the silver ring around the top and bottom of the shade made of? Is it painted or a metal rim? A The Visual Comfort Thomas OBrien Bryant 1 Light Decorative Wall Light TOB2002PN-NP/ST shade is described by the manufacturer as a "Natural Paper Shade with Silver Tape". Q Can this fixture be used over a bathroom sink? Can it be used in the same room as a shower? 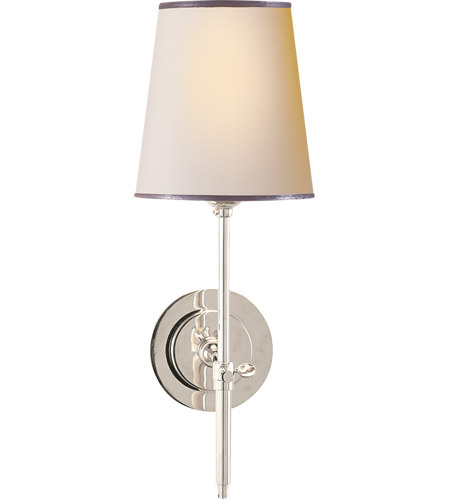 A The Visual Comfort Thomas OBrien Bryant 1 Light Decorative Wall Light TOB2002PN-NP/ST is not ul rated for wet/damp. If it is used in a bathroom it will cause the shade to deteriorate and wrinkle. The finish will also patina faster and not appear as it should. Q How well will this fixture hold up in a public restroom? A The Visual Comfort Thomas OBrien Bryant 1 Light Decorative Wall Light TOB2002PN-NP/ST is not intended for use in wet/damp locations. 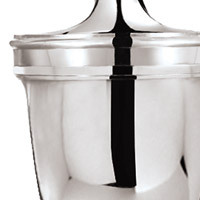 It will cause the item to patina faster and the shade to wrinkle. Q Is there a shade available or recommended to replace the paper one? I would like to use a 60 watt bulb but according to your specifications that is not possible with the paper shade. A For the Visual Comfort Thomas OBrien Bryant 1 Light Decorative Wall Light TOB2002PN-NP/ST: Visual Comfort do not have an alternative shade available for this fixture. Q Would love to use a pair in bathroom with little use. Is this fixture appropriate in this situation? Q The knob appears to be gold, is it the same color as the rest of the light or different? I am hoping this is a reflection. 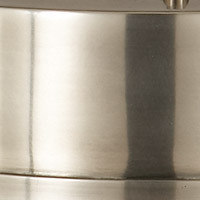 A The Visual Comfort Thomas OBrien Bryant 1 Light Decorative Wall Light TOB2002PN-NP/ST has a Polished Nickel finish. The gold color you see on the knob is just a reflection from the warm glow of the bulb. A The Visual Comfort Thomas OBrien Bryant 1 Light Decorative Wall Light TOB2002PN-NP/ST shade dimensions are: top diameter 4", bottom diameter 5.5", height 6".